If you are a homeowner in Killeen TX who is planning a home improvement project, weekend garage clean out, or a major landscaping project, then will likely want to search for a reliable dumpster rental Killeen TX. 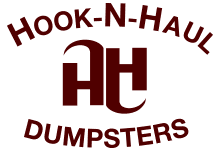 Hook N Haul dumpsters is a top choice for dumpster rental Killeen TX and a dumpster rental you can count on when you need a roll off dumpster. Hook N Haul dumpster rental can take care of everything from delivery and placement to pick-up and disposal. You can use the dumpster for removal of just about any type of waste, including: Roll Off Dumpster Rental, Concrete, Debris and Yard Waste, Metal, Construction Site Clean-up, Solid Waste, and Junk Removal. When you have a home improvement project a lot of thought will go into the build and design but little thought into the waste material that is being torn down or the excess material that is not needed. A dumpster rental is perfect for keeping a work space nice and tidy as well as keeping the trash, debris, or material waste from blowing off into a neighbor’s yard. We offer a variety of Killeen dumpster rental sizes and sometimes it can confuse our customers as to what size roll off dumpster they need for their project. Choosing a dumpster size is not an exact science, but that’s where experience comes in. Hook N Haul Dumpster Rental professionals can discuss your project and recommend an appropriate sized dumpster for your project. Here are some specifications and broad guidelines for each dumpster size we provide. 10 yard dumpster rental Killeen TX is usually appropriate for small remodeling projects and medium sized clean up projects. 12 yard dumpster rental Killeen TX is a dumpster that still is driveway friendly but offers that extra room you may need past what the 10 yd dumpster offers. 20 yard dumpster rental Killeen TX is going to be considerably longer than a 10 yarder. 20 yard dumpsters are generally best for medium sized renovation projects and large home clean up projects. 30 yard dumpster rental Killeen TX is going to have considerable higher walls than a 20 yarder. 30 yard dumpsters are generally larger than what is necessary for any but the largest home cleanout projects, the are generally used for larger remodeling and renovation type projects. With the different choices of dumpster rental sizes sometimes it can leave our customers in Killeen TX, feeling overwhelmed as to which size of dumpster they need for the project or job they have. If you have questions about the size of dumpster rental you need the best decision is to always choose a size up to ensure you don’t load the dumpster past the weight capacity or just call Hook N Haul dumpsters to ask us what size we recommend based on the type of job and amount of waste you have.